"Football is a simple game; 22 men chase a ball for 90 minutes and at the end, the Germans win." So quipped Gary Lineker, an English international, after losing to West Germany in the 1990 World Cup. As in life, so in art: Pro Evolution Soccer 2011, sometimes subtitled by its traditional Winning Eleven moniker, is also a simple game. At the very least, the latest incarnation of the Pro Evo franchise is a familiar game -- it has a manager mode, called "Master League"; a handful of tournament modes; "Become a Legend," in which you guide one player through his career; and standard online play, buttressed by remarkably stable netcode. The game sports a glossy, polished sheen and an elegant and intuitive UI that I wish more sports games adopted, but it's unfortunately marred by character models and animations that tiptoe, with great trepidation, toward the uncanny valley. It is, more or less, the logical continuation of the Pro Evo series as we've come to know it over the past, oh, four or five years. 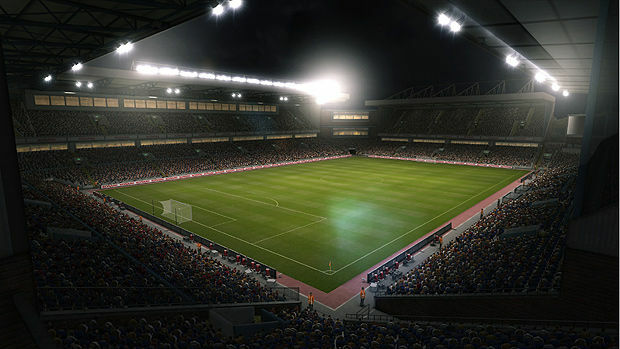 PES 2011 is a game in conflict: the same mechanics that mark it as a crucial (albeit incremental) contribution to the sports sim genre undermine it at every turn, revealing cracks in the fundamental design of the game. But first, the obvious problems with the game: it's unintuitive and unresponsive. Players feel sluggish with respect to your input, the character animations don't accurately reflect or react to the game's collision detection, and passes and shots fly off at angles incongruent with pesky things like physics, center of mass, or human physiology. In short, PES 2011 does a terrible job of convincing gamers that their inputs have discernible on-screen results -- there's no visual feedback to speak of. And yet, it can be a very fluid, beautiful, and exciting game. Because PES 2011's passing assistance is relatively loose compared to other soccer sims, passing into space is remarkably effective -- think more German counter-attacks, and less Spanish tiki-taka. Learning to play PES 2011 is less about becoming a smarter or more technically savvy player, but is an exercise in massaging and noodling the engine, learning its ticks and adapting accordingly. The input lag is noticeable, and I hated playing the game until I learned how and when to compensate for it. 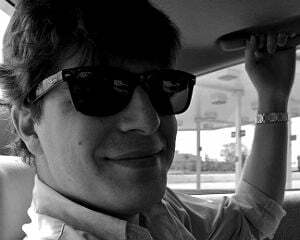 I've come to enjoy the system, but the barriers to entry are high. Technical issues like physics and animation aside, player AI is another of PES 2011's, uh ... quirks. The defensive AI is good at blocking passing lanes and sweeping up loose balls, but not at tackling. Similarly, when the player is defending, pressing the tackling button is more a suggestion than a command. The offensive AI is in a similar quandary -- unlike most soccer sims, there isn't a button dedicated to sending attacking players on penetrating runs. So players have to rely on the game's own AI to make plays instead of dictating the run of play themselves. The rub: the AI is fundamentally flawed for all but the best footballers in the game. 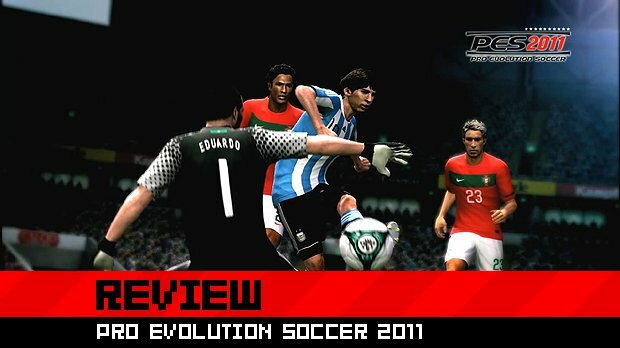 Luckily for PES 2011, many of the game's bad design choices are don't hinder the game's strengths: "Master League," Pro Evo's version of the now-standard manager mode, is, quite simply, the best of its kind I've played in a soccer sim. It's intuitive, accessible, and functional. Master League is in-depth without being opaque, and customizable without being overwhelming. Players can control every aspect of a team's growth -- recruiting, youth teams, different training regimens -- and dig into different coaching schemes, formations, and offensive and defensive strategies. Granted, this sounds like standard fare for sport sims, but I've never played a soccer game in which those types of changes translate so fully into in-engine matches. You can, for example, set up a series of if/then statements in the coaching screen that will, in theory, send your fullbacks on deep runs down the wings if you're losing after 70 minutes of play. When these player-created routines begin, they're noticeable and dramatic, and they do much to mitigate the AI foibles I mentioned earlier. 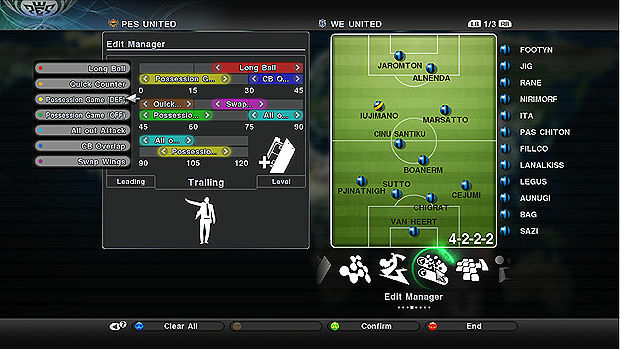 PES 2011 is full of these interlocking mechanics that bridge the gap between the managerial responsibilities of "Master League" and the matches you'll be playing (or simming, if you so choose). The formations and schema you choose affect player happiness, which can impact them on the transfer market. Win games, and your scouts will have an easier time signing good players. Again, this type of functionality should be industry-standard by now, but the fact remains that PES 2011 houses a highly responsive set of systems -- "Master League" is a pleasure and the possibilities are legion, all bundled with an easy-to-use drag-and-drop user interface. My only complaint is that, despite all of your preparation and tweaking, PES 2011 often strips control from you and makes its own tactical changes during matches. It seems to me that this undermines not only your hard work, but also the design goals of something like "Master League." This annoyance is mitigated by the fact that the computer's changes are generally pretty smart. Konami scored a coup when it secured the rights to use the UEFA Europa and Champions Leagues in Pro Evo, and the synergy of European professional soccer lends itself well to "Master League" -- each game matters because domestic play determines your Europa berth, which can translate into a Champions League appearance, etc. Each season feeds off the one before it, and each game feeds off the choices you make as a club manager. 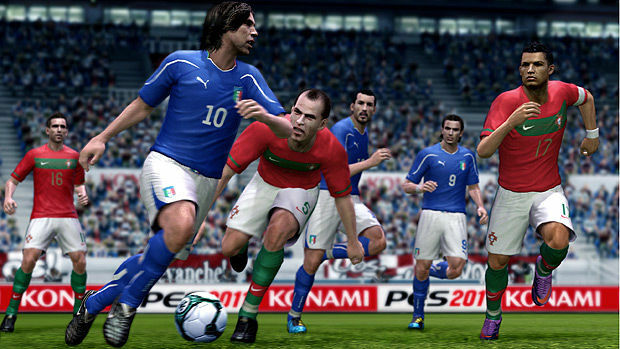 Sure, much of Pro Evo's appeal rests on the back of the Champions League, but Konami has successfully leveraged that appeal, working it into every aspect of PES 2011. The game's "Become a Legend" mode, conversely, only exacerbates the engine's problems without the macro-managing of "Master League" to mitigate them. The idea behind "Legend" isn't a new one: control one player through his career, managing his growth until he obtains international super-stardom. Growth is governed by the distribution of talent points, which are gained by playing well, week in and week out. Unfortunately, the mode is nigh-unplayable: the camera angle is unhelpful, you can't call for a pass, and if you do manage to win the ball, you'll find no one available in support. Without any way to dictate the flow of the game, players simply bumble their way through matches. It's frustrating, it's not fun, and PES 2011 would've been better off without it. Despite the remarkable shortcomings of "Become a Legend," PES 2011 has lots to offer. It's a highly tactical game that rewards players who can maintain and develop long-term goals. "Master League" represents a cohesion of design that does much to negate the many shortcomings of the actual matches. 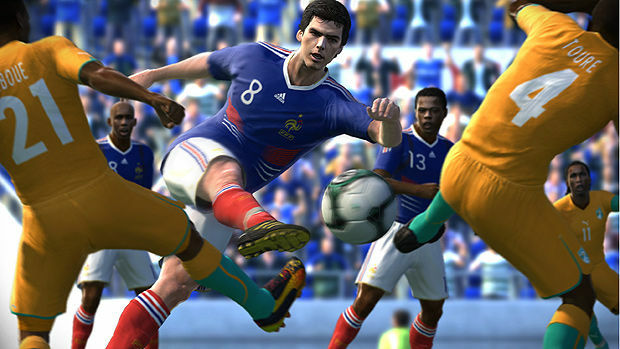 Making the density of sports management accessible and fun is no meager feat, but Konami's lackadaisical approach to the nuts and bolts of sports sims -- animation, physics, controls, collision detection, feedback -- hold Pro Evolution Soccer 2011 back.